This is a chilli pepper post as I end up harvested two kinds of chilli peppers today; the Bishop’s Crown pepper, which is a cultivar of Capsicum baccatum, and the Bird Chilli pepper, which is a Capsicum frutescens. Bishop's Crown chilli peppers (Capsicum baccatum var. pendulum) from the balcony. Only the centre part of this chilli is hot, the wings are sweet. They are also known as Friar's Hats or Monk's Hat peppers. 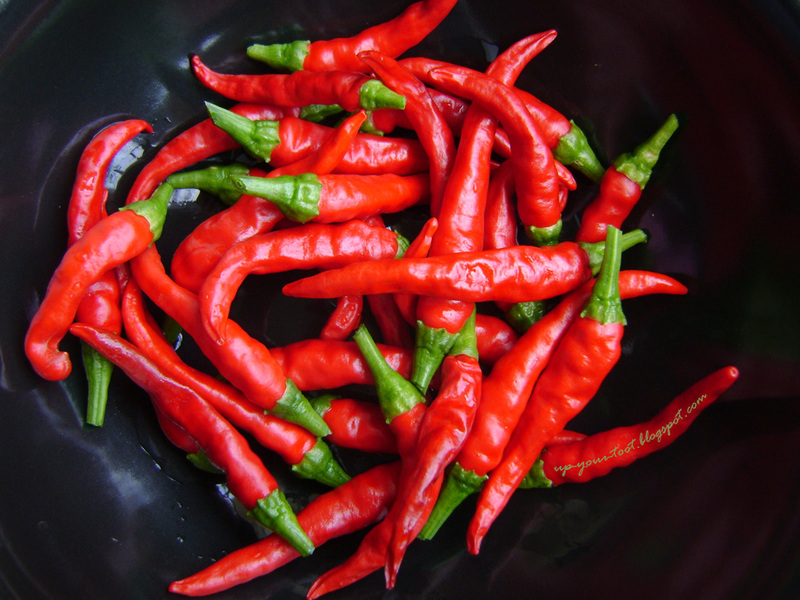 Bird chillies - they are of moderate heat, and can be dried easily. I prefer them pickled in vinegar, which is how these will end up. The fruits on both of them have all turned red (well almost all for the Bishop’s Crown peppers). 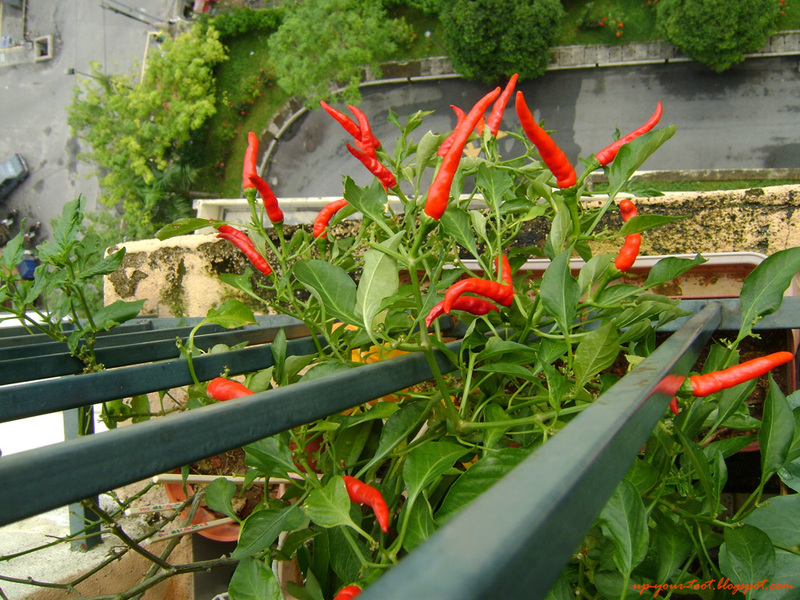 As the amount of peppers produced is small due to weather and severe spider mite attacks, I had left them on the plant since the ripened fruits add colour to the plants in the balcony instead of picking them off as they ripen. Now that almost all of the chillies have turned red, it is time to remove them to get them to produce the next flush of fruits (and deny passing birds a quick meal on the 13th floor). 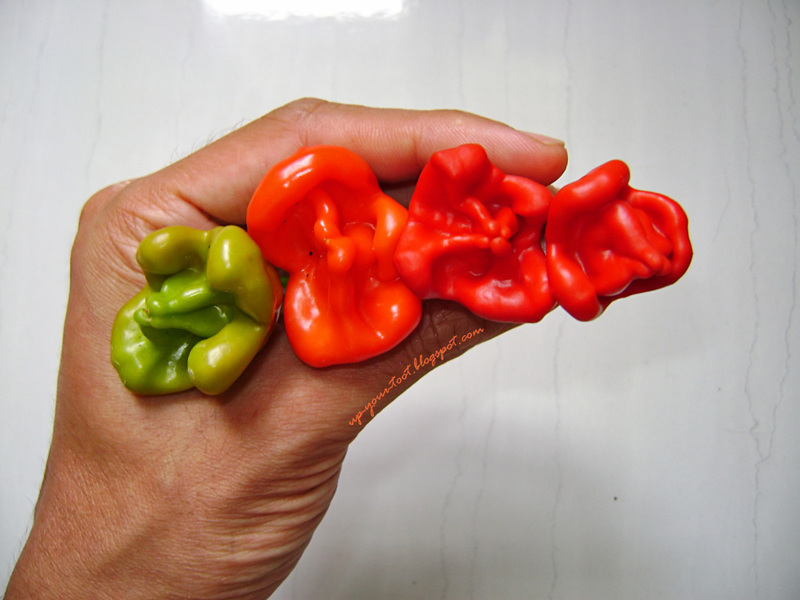 From greenish yellow to orange to red - Bishop's Crown peppers under different stage of ripeness. The Bishop's Crown chillies before being snipped off the plant - a bit like flying saucers hovering around the mother ship. If you want to see how the flowers look like, please click here. The bird chillies will be pickled in vinegar, which helps to kill some of the heat of the peppers, thus making it more palatable whilst the Bishop’s Crown peppers will be seeded and dried. 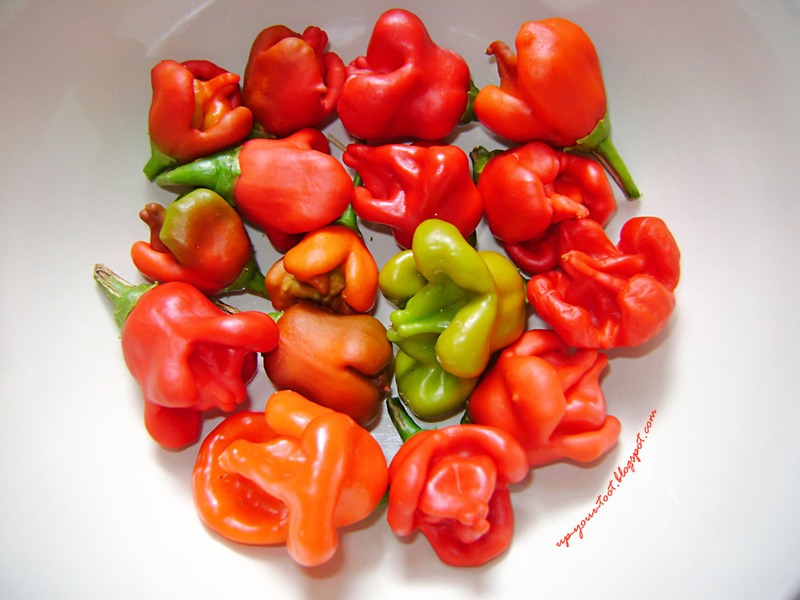 When dried after reaching ripeness, Bishop’s Crown peppers have a nice sweet, fruity taste. 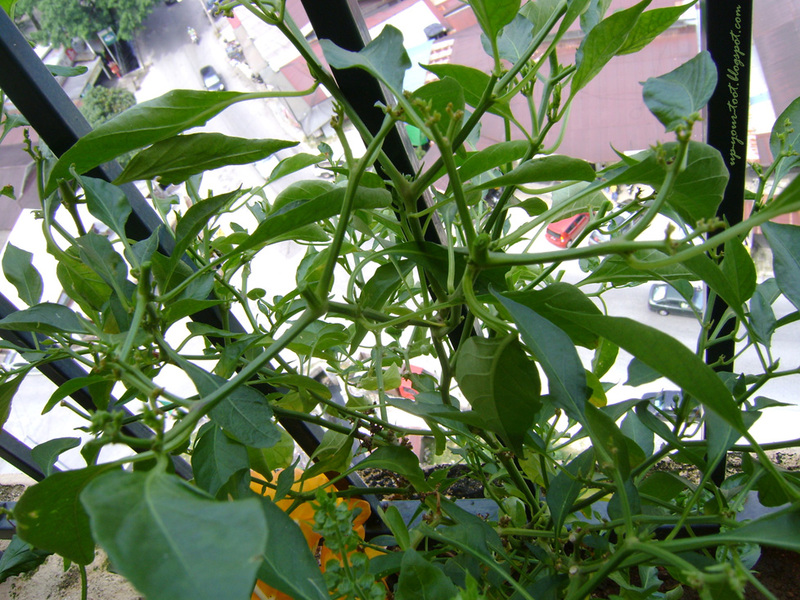 Enticing birds in the neighbourhood - red bird chillies (Capsicum frutescens) for grabs on the 13th floor. 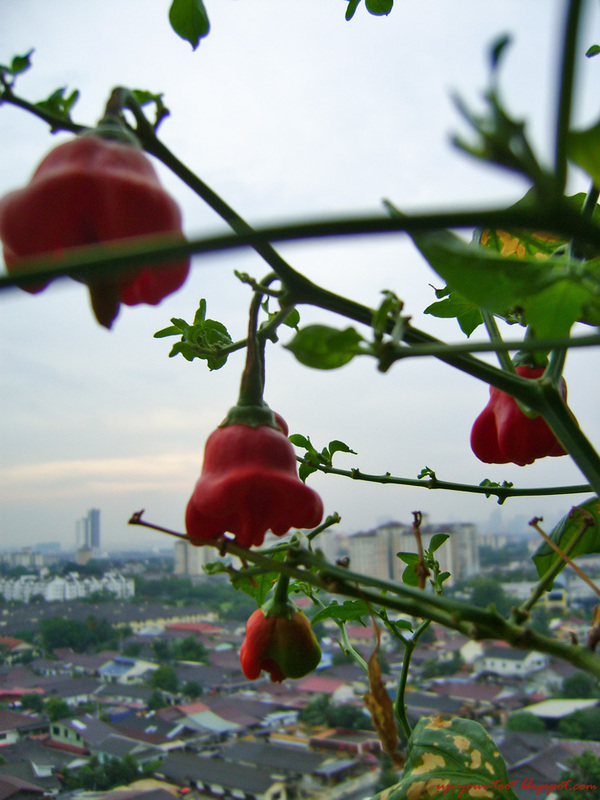 The Bird Chilli plant sans the ripe fruits. It won't be long before the next flush of flowers comes out. The taste of dried Bishop's Crown peppers is somewhat akin to that of dried Goji berries but with the sweetness of dried tomatoes. After all, they are all members of the Nightshade family (Solanaceae) – Goji berry belongs to the boxthorn family of Lycium, tomatoes are now a Solanum (together with potatoes and aubergines), and chilli peppers are Capsicums. Ya Kak Mar, terutama kalau masih kat pokok, nampak cantik sebab macam tanglung berwarna-warni kat pokok cili ini. Sebab itu saya adakala malas nak petik bila buah ini mula ranum dan akibatnya burung gagak dan gembala kerbau datang berkunjung. Secara kebetulan pula hari ni sowed both of these chilli seeds. Froom your description tak sabar pula nak rasa. Tersengih dengar passing bird ambik kesempatan sambil terbang.Like the photo flying saucers tu. Pokok Bishop's Crown memang tahan. Adakala kering tak disiram, bogel diserang spider mites, but they always come back. Kat Adelaide senang nak dpt chili nih. I hairan mengapa org kat sini tak tanam. I like the taste of the flesh better than bell peppers. Actually pokok tu produce a lot more fruits, cuma makin ranum makin kurang buah yang tinggal. Yang nampak cuma kelibat burung terbang dari balcony - sah ada pencurinya.